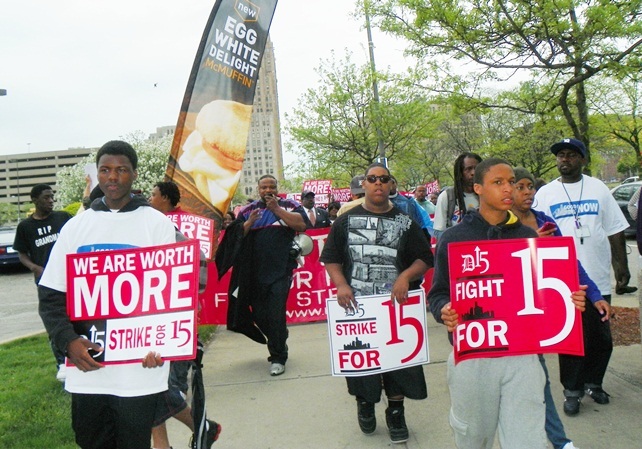 DETROIT FAST FOOD WORKERS STRIKE, DEMAND $15/HR. 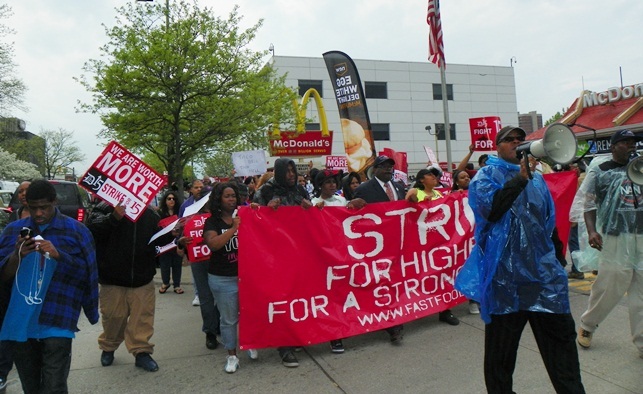 Pastor Charles Williams II leads march as it takes off outside New Center McDonald’s May 10, 2013. “WE ARE WORTH MORE!” — http://detroit15.org/. 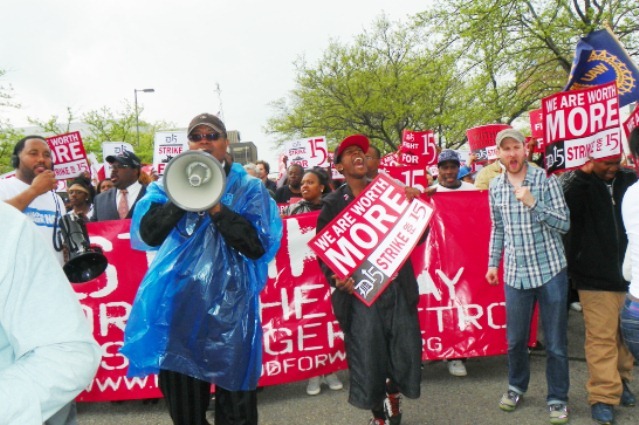 DETROIT – The bright faces of Detroit’s youth on the march March 10, to double their wages at fast food outlets, lit up the gray skies of a city battered for decades by the nation’s most vicious assault on working and poor people. The assault has included skyrocketing youth unemployment, police victimization, and incarceration. 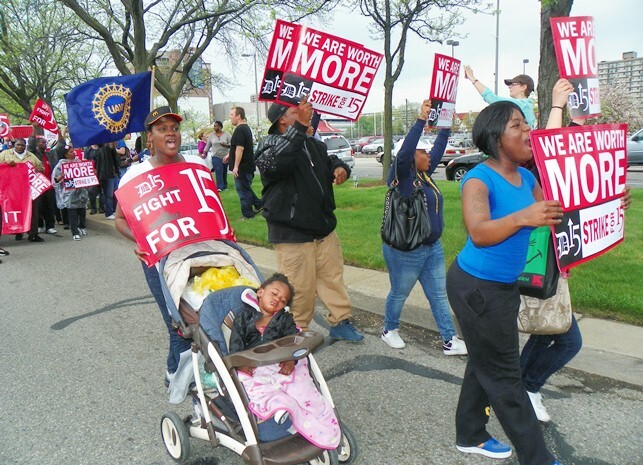 MacDonald’s workers April Jones (l), with baby, and Tequila VanHorn (r), lead march as it takes the streets. 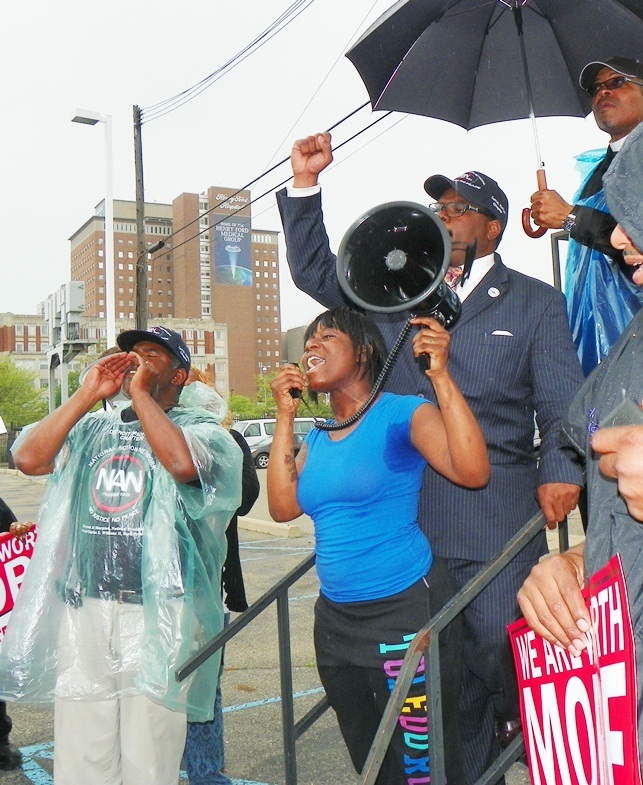 Workers walk out at Detroit Burger King May 10, 2013. 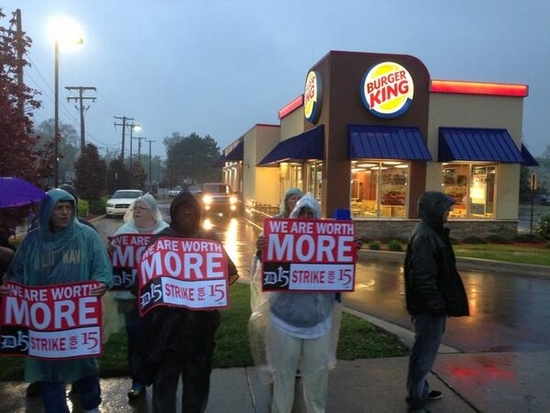 Metro Detroit MacDonald’s, Popeye’s, Burger King, Long John Silver and Subway outlets were hit by the strikes. Fast food employees have begun a rolling national strike wave. They walked out in St. Louis May 8 and 9, and New York City and Chicago last month. Tequila VanHorn, 21, is expecting her first child. She works with Jones at the same MacDonald’s. Youth from local high schools joined the march, knowing their futures are also at stake. High school students including brothers James and Andrew Williams, 16 and 17, and Jerome Winbush were among dozens of other youth who joined the workers, recognizing that their futures are also at stake. Tequila Van Horn rouses the crowd with Pastors Charles Williams II and Willie Rideout behind her. Dozens of exhilarated older people, many who came of age during the movements of the 1960’s, also participated. The strikers are also demanding the right to unionize. Michigan was the birthplace of the union movement in the 1930’s, but last year, incredibly, it became a Right-to-Work state under the extreme right-wing leadership of Governor Rick Snyder and the majority of the state’s legislators. Detroit itself, which has lost over 237,500 residents due to predatory lending and foreclosures and over half its public schools, while paying billions in predatory debt to the banks, expects its Emergency Manager Kevyn Orr to declare his plans for yet more assaults on its residents May 13. 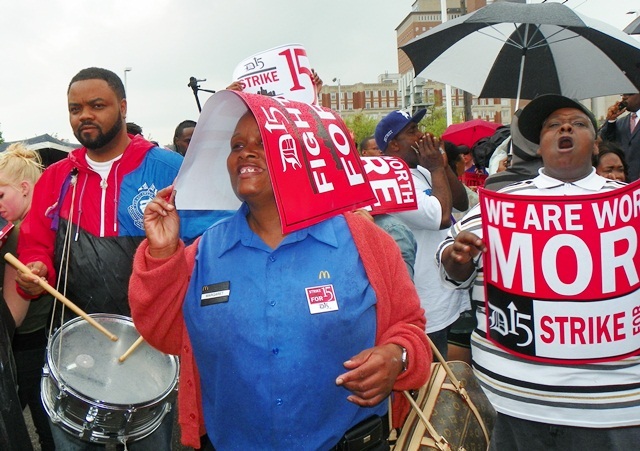 MacDonald’s worker shiields herself from rain as drummer gives rhythm to chants. 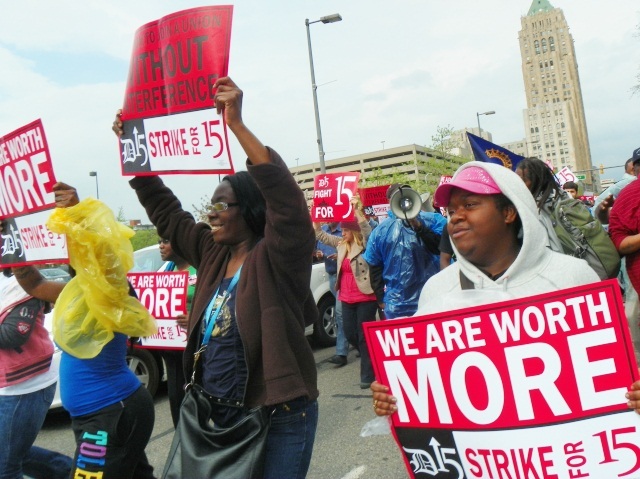 D15 is coordinating the fast food workers’ campaign in the Detroit area, according to its website at http://detroit15.org/. It has support from local ministers, the Service Employees’ International Union (SEIU), the United Food and Commercial Workers Local 876, and the “Good Jobs Now!” movement. D15 organizers estimated at least 400 workers participated in the walk-outs here. “There are now more than 50,000 fast-food jobs in the Detroit metro area, more than twice as many as in the auto-manufacturing sector,” says D15’s website. “Fast food jobs are projected to grow by 12.3% in the area by 2018 – more than twice as fast as the projected growth rate of the region’s workforce as a whole. But these jobs are the lowest-paying in Detroit, with many workers earning Michigan’s minimum wage of $7.40 or just above it. Young marchers’ faces were filled with hope. 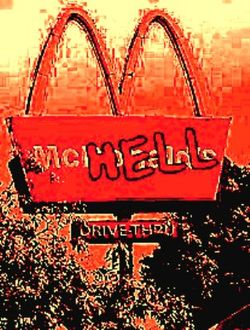 According to D15 organizers and other observers, the walk-outs in Detroit began at 6:00 a.m. when 20 McDonald’s workers at 10400 Gratiot on Detroit’s east side walked out. Management called in other workers to replace them, but they also joined the strike. Seven workers at a Long John Silvers in suburban Warren walked out shutting down that outlet, while Subway workers at the city’s Renaissance Center did the same. 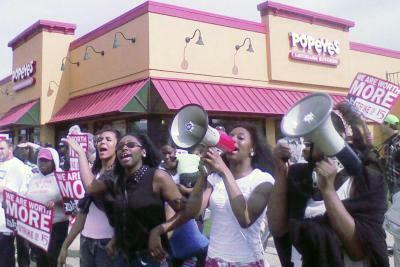 Likewise, workers at a Burger King on W. Eight Mile and a Popeye’s on Grand River in Detroit also left their jobs. Marchers take W. Grand Blvd. The workers are demanding no retaliation and are calling on the public for mass support. McDonald’s worker Keith Bullard, of Inkster, has started an online petition for support on MoveOn. “This morning, I walked off my job at McDonald’s,” he said in an email to news outlets including VOD. “I’m a 29-year-old husband and a father of two. My wife can’t work because of health problems—and the $7.50 an hour I make at McDonald’s just isn’t enough to cover my family’s basic needs,” he said. Workers say it’s hell to work at McDonald’s and other chains. I’m not alone. All across Detroit, many more workers like me are also striking— Join us. My coworkers and I need as many folks standing up with us as possible. Together, we’re launching the D15 campaign—for workers, for families, and for Detroit—and standing up to the enormous corporations we work for to make sure they get a simple message: Workers like us should be paid a fair wage that lets us make ends meet. Marchers return for rally next to MacDonald’s. 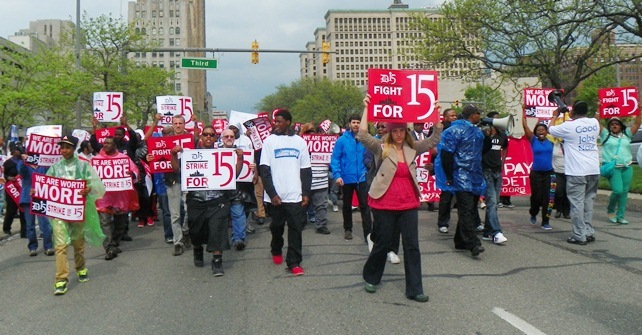 One Response to DETROIT FAST FOOD WORKERS STRIKE, DEMAND $15/HR.